Rabbits are well-loved parts of many families that have the joy of caring for them. But unfortunately, and just like other pets, rabbits are prone to a variety of problems and diseases. 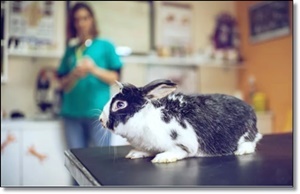 Some diseases are more common than others and by being educated on these problems you may be able to prevent them or at least learn to recognize the signs and symptoms more quickly in order to get your rabbit help. Rabbits have 28 teeth that help them grind their food. These teeth, unlike those of a dog or cat, grow continuously throughout the life of your rabbit. Without proper items to help keep these teeth trimmed (like hay and safe wood) the teeth can end up becoming overgrown and prevent your rabbit from being able to eat. Molar teeth (the teeth in the back of the mouth) can grow and create a bridge over the tongue which can inhibit chewing and swallowing. Teeth that become this overgrown can cause your rabbit to starve. Incisors teeth (the front teeth) will grow and start curling into the cheeks or other parts of your rabbit's mouth. This is very painful and can also cause your rabbit to stop eating. Abscessed teeth can occur due to trauma or periodontal disease and are painful to your rabbit as well. These teeth need to be extracted in order to prevent the infection that is located around the tooth from spreading throughout your rabbit's body.